So here’s the conclusion of the list; the real heavy weights. As we said before, there are no roller coasters on the remainder of the list, and all the attractions are located at either Disney or Universal theme parks, simply because they’re the only ones who can afford them. The original of four, and the definitive version, Hollywood Studios’ main attraction is one of the most mechanically complex rides ever built. Disney stuck together the thrill-oriented drop tower concept and the adult-oriented horror theme and as if by magic pulled out a phenomenal family attraction. 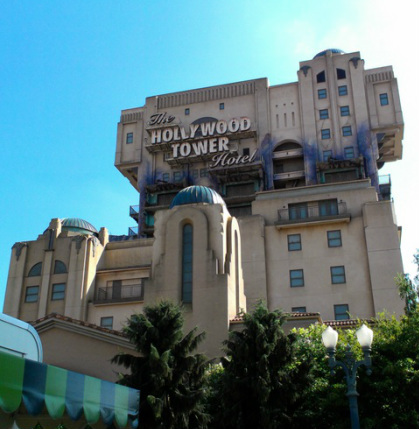 The ride is themed to an episode of The Twilight Zone, the popular 1960s paranormal science fiction show, and takes place in 1939 in the fictional Hollywood Tower Hotel, an hotel geared to the celebrity elite; we are told it was a star in its own right. But on one fateful night in 1939 an elevator was struck by lightning and it, with its five occupants, was transported to the 5th dimension, and was never seen again. You take a trip to the now deserted hotel and, as the elevators are gone, you take a maintenance service elevator, and of course the same thing happens. The physical aspect of the ride is very impressive. You begin in a short vertical shaft which lifts you up two levels, showing you first the ghostly figures of the five lost souls in a hotel corridor before taking you to the 5th dimension. The hotel corridor turns to black and stars begin twinkling in the background, and in an element that took me completely by surprise, you begin moving forwards through the scene. At the end of the corridor you slot into a larger tower and then the final drop sequence; at the very end you are taken to the top of the tower and the doors open, giving an incredible view of the whole park ahead of the final plunge. Is it worth it? Yes. The ride is not intense; the drops only really give a floating sensation, but the theming and the acting of the ride operators combine to provide an electric experience. Now this one is a bit of a guesstimate on my part; the Harry Potter expansion cost an overall $200 million, and as there were no other major rides to speak of in the development, and the largest part of the theming in the area is part of the ride itself, I think it’s fair to say the ride and its housing cost at least $150 million. The Wizarding World of Harry Potter (which is not a theme park as many think; it’s an area in Islands of Adventure) was highly anticipated and met with critical acclaim upon its unveiling in 2010. The area is comprised of a recreation of the town of Hogsmeade, complete with the Hogs Head, The Three Broomsticks and Ollivander’s wand shop (which is actually in Diagon Alley in the books). The legendary Dueling Dragons roller coaster was rethemed to tie in as Dragon Challenge (as in the 4th book, Goblet of Fire) but the main focus is Hogwarts castle itself, which is home to Harry Potter and the Forbidden Journey. Without revealing too many details the ride takes you through the Wizarding World, travelling on an enchanted bench, over Hogwarts itself, through a quidditch match, coming face to face with various beasts such as dragons, giant spiders, dementors and even the Whomping Willow. The technical aspect of the ride is interesting and the main cause for expense; the seats are mounted on top of a KUKA robot arm; the kind that welds cars together on production lines, which is then mounted on a wheel base. This means the seats can move in virtually every direction and even flip riders upside down whilst the track is still flat. Is it worth it? Yes. The innovative track/arm system combined with a lengthy ride time and newly shot material with the stars of the original films means it has often been called the best dark ride in the world. When the original opened in 1994 plans were already afoot for a second, studios themed park in Paris. The idea was that a redesigned version of Tower of Terror would be installed as one of the original attractions, however due to budget cut backs it never came to fruition and the park opened in 2002 with no real headline ride. Florida’s version, as I mentioned above, was mechanically very complex, and had a flawed design in that if one of the two drop shafts malfunctioned, two of the four elevators would have to be closed (as each pair of elevators share a drop shaft). Disney redesigned so instead of 4 initial shafts, 4 horizontal segments and 2 drop shafts, there would be just 3 all-inclusive towers. There would be no slow 5th dimension sequence and all the towers would be independent. This allowed for a shorter ride cycle, less chance of malfunction and thus a higher capacity, as well as the ride being cheaper to build. The updated version was first installed in California in 2004, then in Tokyo in 2006 before Paris finally got their long-overdue flagship ride in 2007. But during early construction an obstacle was hit when it was realised that French regulations wouldn’t allow buildings of a certain height to be made from solid concrete; they require a steel frame. This hitch is the reason for the huge cost as the ride had to be redesigned once again to take this into account. Is it worth it? Kinda. Although it’s not as good as its Floridian sister, which cost $100 million less, it’s still very good and has been a game changer for the park. The studios has generally been considered the weakest of the 11 Disney parks and Tower of Terror is a sign that they could be turning that around. It also boosted the gate figures from 2.5 million in 2008 to 4.5 million by 2010. California Adventure, Disneyland Resort’s second park, opened in 2001 to general disappointment. The park was poorly planned and was full of questionable ride choices, including a wild mouse roller coaster and an S&S drop tower. To many it didn’t feel like true Disney material, and so for a while it garnered the lowest attendance of any of their parks. As I said, Tower of Terror was installed in 2004, which helped, but a full scale revamp was needed to really pull it up to the standard it need to be to compete with the ever-invigorated Universal. So in 2007 major expansion and redesign began implementation at a cost of $1.1 billion (almost double what the park originally cost). Toy Story Midway Mania was brought in, a new Buena Vista Street entrance land was created and finally the long awaited Cars Land opened in 2012. Themed to the 2006 film of the same name, and its 2011 sequel, the land depicts Radiator Springs, an oasis town in the Arizona/New Mexico desert. Whilst there are a few teacups style rides and food and shopping outlets, the main attraction is of course Radiator Springs Racers, which is the third and most recent in a line of ‘Test Track’ style rides (see below). These rides are effectively giant scalextrics; electric cars on a conducting track (they’re not roller coasters as they are powered only by electricity, not gravity) and Radiator Springs Racers is the first of the three to have two racing tracks side by side. It takes you through a dark ride section, interacting with the residents of Radiator Springs, before blasting you out in a racing finale around Ornament Valley. Is it worth it? Yes. The ride has been a hit with the kids and adults alike (reportedly garnering queues of up to 6 hours last year), and is the key to the expansion which has elevated California Adventure’s status from subpar Disney park to one at the very top of the pile. Three. Hundred. Million. Dollars. That’s 1250 Ferrari 458s. Or a billion Freddos (literally). Epcot has 3 rides and their total cost is more than the majority of theme parks, it’s more than every ride at Thorpe Park and Alton Towers put together, and Test Track makes up more than half of it. Part of the ridiculous cost was due to redesigns during construction; the ride system is very electronically complicated and at the time suitable computers were not readily available. Because of the lack of rides at Epcot, imagineers knew the attraction would need a large capacity, but the computers they had could only handle 6 cars on the track at any one time. They calculated that to run maximum capacity on a track of that length they would need a ridiculous 29 cars, and so spent an extra year installing and programming a variety of computers to handle all 29. And because of this there are simply so many sensors that there is a huge chance that every so often one will be triggered incorrectly, and for safety reasons whenever one malfunctions the ride has to shut down. The ride itself is also very extensive; the queue line takes you through various production lines showing you how all sorts of products are tested (did you know televisions are smash tested with rubber hammers?) before you board the vehicle and are taken on a few tests of your own. There are hot and cold rooms, an acid test, a slalom and a brake test. Finally you are shot out of the building at 65 mph, making it Disney’s fastest ever ride, through a huge banked turn and back to the building. It’s a blast. Is it worth it? Not really. The ride is good, it’s the best in the park, but it’s not great. It does have a decent capacity, but it’s little more than a slow dark ride through some interesting scenery with a fast outdoor finale.